Supplemental Unemployment Plan | Fresno, Ca - EBAC - Employee Benefits Administration Corp. Although employers do everything in their power to consistently keep employees working, some of the time it is not possible. 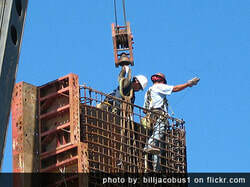 The prevailing wage predicament is that the average construction worker works approximately 1,500 - 1,600 hours per year, instead of the normal 2,000. When working, most have the ability to sustain the lifestyle they desire, but when workers are laid off or their hours are reduced, the ability to keep up with financial obligations becomes very difficult. EBAC has a solution. The EBAC "SUB Program" (Supplemental Unemployment Benefit Program) allows your employees to direct a portion of their earned Prevailing Wage Fringes to a segregated SUB Fund. These contributions accumulate during periods of consistent work. Funds can then be claimed by the employee in the event of a layoff, short work week, or termination. Their ability to claim these funds without a reduction of any state benefits gives your employees the peace of mind knowing they can plan for the inevitable. With this supplemental unemployment benefit plan your employees can plan for these times and help offset the ups and downs of their income. All funds contributed to the SUB Plan are not subject to Labor Burden Taxes and are not considered wages for Worker's Compensation Premiums. Your employees will be less likely to leave for another job because they know they can financially weather a temporary layoff or short work weeks because of their contributions made to the SUB Plan. This "Money Now" plan can give the employee access to a level pay scale all year long. With EBAC Solutions you will have a true feeling of confidence knowing you are correcting a problem the industry has been plagued with for decades. For more information on our SUB Distribution plan, read the below "Rules and Regulations". Employees looking to make a claim, please fill out our new "SUB Claim Form" with the electronic verification/signature system. Please remember, these forms are due by midnight on Wednesday to have funds available on your Visa cards by Friday! once we process your form. If you would like to have a distribution the week of Thanksgiving, your claim will need to be filed by that Monday, November 19th at midnight to receive funds on Wednesday, November 21st. Any claims filed after midnight on Monday will be processed the following Friday, November 30th 2018. The last claim contributions of the 2018 year will be distributed Friday December 21st. There will be no distribution claims available Christmas week and New Years week. Any Claims that are made between December 24th and January 5th will be on your Visa card on January 12th.